"...He served in England, Russia and France for a period of 30 months. 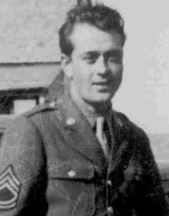 He participated in the battles of Rhineland, Central Europe and the Air Offensive over Europe..."
Melville Wesley Bever was inducted into the Army Air Corps 16 Feb 1942, at Ft. McArthur, CA. 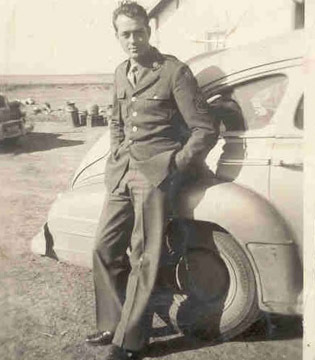 He graduated and received a diploma from the Yakima, Washington Training Center for Air Corps Engine Mechanics and received his non-commissioned officers rating. 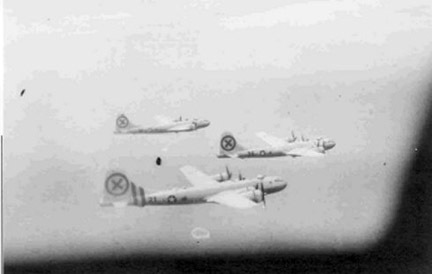 He then joined the 509th bombardment squadron, 351st bombardment group, with the 8th Air Force in England and was rapidly advanced to Master Sergeant. His squadron was one of the first to reach England in those trying days when many of his planes returned heavily damaged. 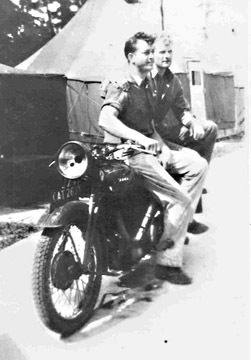 Note from Mel's daughter: "It was while serving from RAF Polebrook in England, that family stories always mentioned that my dad and actor Clark Gable became good friends and did some "partying" and even rode bicycles for fun together. I never really believed them until I just recently found information on the internet that Clark Gable actually did serve with the 351st bombardment group, 509th bombardment squardron!" 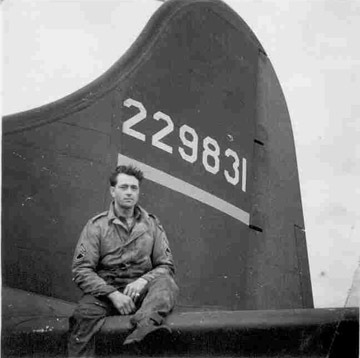 My dad sitting on the tail of one of the B-17's under his care. This particular B-17 is a B-17F, #42-29831 called "the Invader". My dad on left. Anyone know who the man on right is? My dad on left. Anyone know who the other two men are? 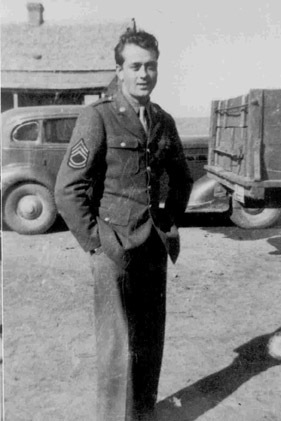 He then volunteered with the ground forces of the 62nd Troop Carrier Squadron for service in Russia. They established the first field to accommodate the bombers that shuttled from the Rhineland to Russia and back. He served in England, Russia and France for a period of 30 months. He participated in the battles of Rhineland, Central Europe and the Air Offensive over Europe. Mel supervised the inspections, maintenance, adjustment and minor repairs of aircraft and aircraft equipment. He supervised the work of 48 airplane mechanics and was responsible for repairs and maintenance of 14 four-engine bombers. Mel inspected and determined priority of jobs and assigned various specialists to duties. Melville served his country a total of three years and nine months with two years, six months and five days in foreign service. He received for services, The Good Conduct Medal, Air Medal and Distinguished Unit Badge. He may have received others, but these were all that were mentioned in his obituary. Sources of information about Mel's military service came from his obituary. Back in Colby, Thomas Co., KS on leave. Many years later, in 1962, I received a certificate signed by President John F. Kennedy stating, "The United States of America honors the memory of MELVILLE W. BEVER. This certificate is awarded by a grateful nation in recognition of devoted and selfless consecration to the services of our country in the Armed Forces of the United States." My Dad took the picture of the planes on the left from the window of his plane. "Will try and write a few lines to let you know I am feeling fine and hope every one back there the same. Received a letter from Zelma telling me there is a new addition to the family. Hope to see them soon. Also got a letter from Vera and a package from Lela. Sure was glad to hear from them. Tell Lela the candy sure was good. I got a letter from Alma telling me Bob was in the Pacific. Was sure hoping he would not have to go across. What is he now a ____ still and enlisted man? If you send some more candy put some hair oil in it, not the candy but in the box with the candy. Well, can't think of any thing to say so will close for this time. After Melville returned home he became active as a member of the American Legion and in the Veterans of Foreign Wars. A very special THANK YOU is extended to BOTH (the late) Mr. Melville Wesley Bever and Ms. Vicki Bever Doze for their kind and generous permission to use the materials contained on this web page. 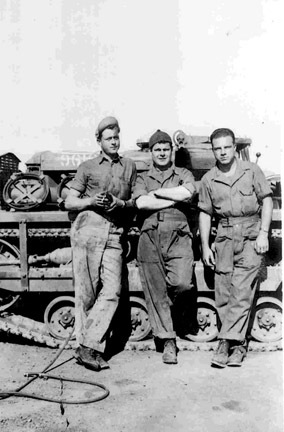 Stories such as this story go a long way in preserving yet another piece of the overall picture that was World War II. Original Story submitted 24 May 2007. Story added to website on 30 May 2007.